This blog post is a case study of my implementation of @JasonAcidre’s Evergreen Content strategy for SEO. He further referenced this strategy in a blog post called My Best Kept SEO Secret on How to Rank for Competitive Keywords. This case study analyses one of my most recent blog posts which was my version of putting this strategy into action for this blog. This case study is most relevant to business owners and marketing managers who want an insight into how this sort of content works to increase their search visibility. 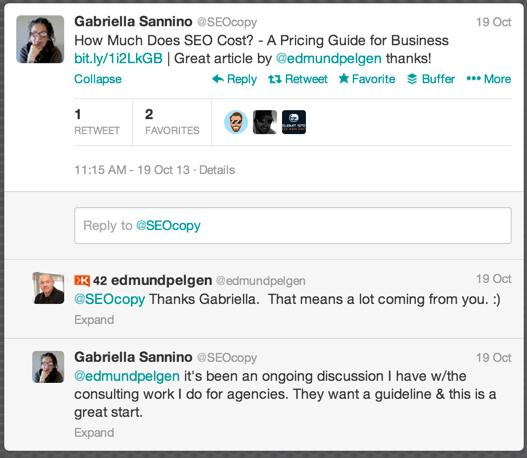 Most of the SEO practitioners who will read this content are already familiar with how this all works. Try to see how this might be applied to your own business blog. I have spent the last four years working for a digital agency where as anyone who has worked in an agency environment can attest, it can be challenging to find time to create link worthy content. This blog, Online Kickstart is my personal platform for me to build my personal brand and develop an audience online. Attracts Links and Social Shares – It must be worth linking to and sharing in social media, especially by other influencers and authorities. Attains organic search visibility – My ideal target audience must ultimately be able to find the content when conducting searches online. Once I get them to my site I can then try to get them to take the required conversion action. @jasonacidre is a blogger and marketer whom I’ve admired for some time due to his content quality, his prolific output and his ability to get a lot of social sharing of his content. [quote]Evergreen content is “Content that never relies on current trends and is simply an informational or reference material that somehow never goes out of date”[/quote] Via Wisegeek. Why is evergreen content so good? I chose to implement this strategy which I felt would be ideal to help me achieve the goals I had set for my blog. So based on several of Jason’s tips on creating robust evergreen content here is what I did. After doing my keyword research I identified that there were a number of very targeted keywords that this post could target. These were the types of keywords that were ideal top of funnel keywords for my site. To target these keywords my blog post title and meta description were written accordingly. Based on how this page title performs in search I can continue to tweak and optimise it further. The goal is to make something that becomes a citable reference. Just like Wikipedia is. That way it will continue to attract links and social shares into the future. So I made this post as epic as I could, not with filler content but with quality insights based on my experience in an SEO agency environment. It topped out at just over 4,000 words. And fortunately several leading SEO’s who I have admired for a long time did in fact refer to the blog post as something that they enjoyed and would share with clients. So from this perspective I felt the blog post had actually achieved it’s goal to become a citable reference that actually helped people. The purpose of this tip is to get you to review the top pieces of content that Google is ranking for these search phrases. Does it answer all of the questions people are asking in the space? Are there gaps, perspectives or approaches that might not be fully explored in these pieces of content? What is the type of content that is ranking? Is it text, video or a mix of content types? After looking at this data you know the minimum required level of quality that you will need to create in order to get something to be worth a high rank in Google. In this case I simply did a Google search for “How Much Does SEO Cost” and analysed the top 10 pages from a content perspective before starting to write my own post to answer this question. I published my post on 17th October 2013 and then shared it with social media. I did not roll out a massive seeding campaign and try to get my post in front of audiences on forums and communities. I simply reached out to several of my peers in Google Plus and asked them for their opinion. I tweeted the post and asked people to share it if they saw value. I used Ahrefs to do a batch analysis of the top 10 URLs ranking for “How much does seo cost” in Google.com and compared the social sharing data with my own blog post. I found it interesting that none of the pages ranking in positions 7 to 9 registered any social sharing activity at all. Especially Google +1’s. It will be interesting to see how long this lasts. I was hoping to get some sharing happening on Google Plus simply because it is so important to visibility in Google organic search. From my analysis I believe the fire got lit under this post by Dan Petrovic, @dejanseo. Dan is a leading Australian SEO and owner of Dejan SEO who’s content and opinion I respect highly. He has a strong audience in Google Plus with close to 16,000 people having him in their circles. His audience consists of many influencers and leaders in the search space to which my blog post would certainly have some appeal. 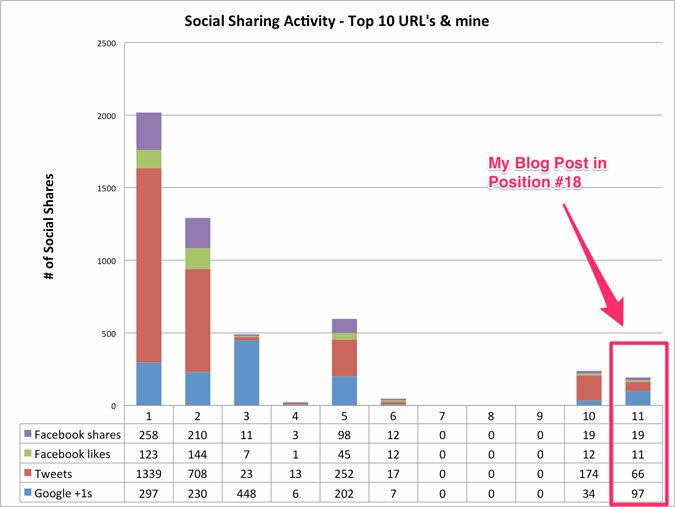 To analyse Google Plus sharing activity I simply used the View Ripples feature that is available on each Google Plus Post. For more information on Ripples check out this post on Google Plus Daily. In the final count though the largest number of shares in Google Plus were delivered via Luca Bove, a Senior SEO Specialist with IMEvolution. I will be the first to admit that the level of social activity in Google plus was completely dependent on being connected to people like Dan and Luca via social media and having them find the content share worthy at all. 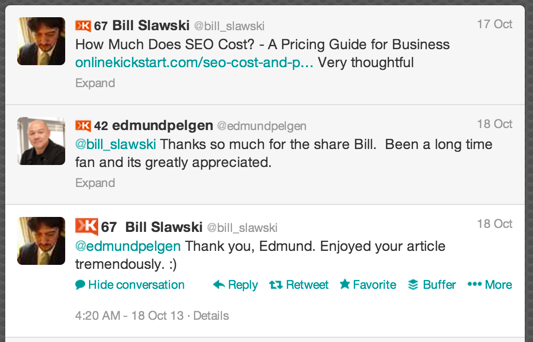 Twitter is a great platform for helping gain visibility for your content. I shared the link in Twitter and the first reshare came from my good friend Daryl King from irekon. According to Topsy, Daryl is one of 8 influential Twitter users who reshared my post. All in all there were 66 tweets according to Topsy. I enjoyed the interaction and sharing on Twitter as I stayed up thanking people for shares and retweets. Here are some screenshots from my Google Analytics between the 16th October and the 23rd October 2013. The first shows the overall spike in traffic to the site over the 7 days. 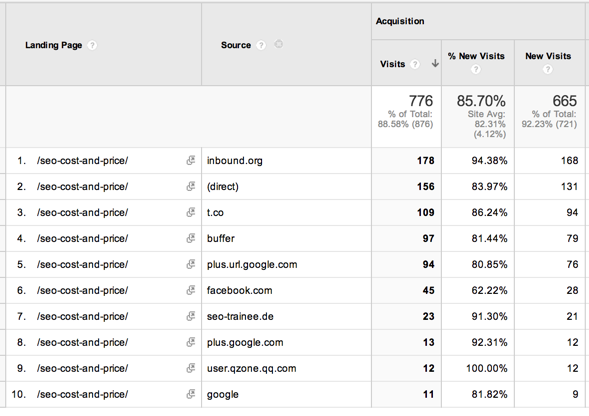 The second shows the top 10 referring sources of traffic to that landing page. During that week the blog received visits from 734 unique visitors. You will note that Google organic is at the bottom of this list which makes sense as the post only entered the search results on page 3. Over time as the ranking continues to improve I expect the post to start to rank for more longer tail phrases and overall organic traffic to the post to increase. Tadeusz Szewczk, @tadchef from Onreact was the first seo to actually ask this very question – you can’t keep a good seo down. What was surprising to me was how quickly the post ranked – albeit on the bottom of page 3. Ranking in Position 18 after a month. So after a month it’s ranking in position 18. I know I won’t see a huge amount of traffic from the post yet, not from page 2, but I’m going to continue to promote the post and optimise it and because it is evergreen content, hopefully it will continue to acquire links. 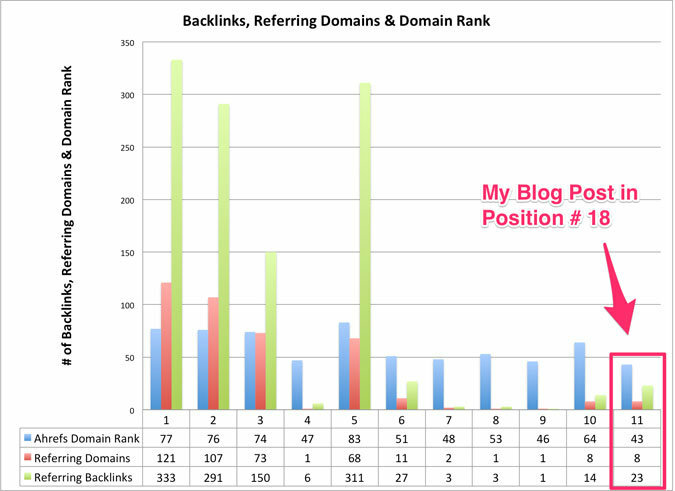 Here is a list of the pages that ranked in positions 1 to 10 that I compared my blog post with. Using google.com, logged out of google. I’ve purposely waited a month to give the major link tools time to index any links out there. I’m happy with that in the first month. As the post continues to attract links I’ll be sure to update this chart. How does my post compare to the top 10 ranking pages? The interesting take away from this data is that there are “pages” ranking on page 1 for this search phrase with very little external back link numbers. (See #7 to #9). What they do have in abundance is domain authority. I used Ahrefs version of domain authority here but you could use anyones. For the metric “Ahrefs Domain Rank”, my site has the lowest Domain rank at 43 which makes sense as it is a pretty new site. The data would seem to indicate that pages ranking in positions #7 to #9 are there because they are on domains with a more authority as compared to mine. Now I get that this data is far from conclusive but I include it for consideration only. Given the performance of this post, Jason Acidre’s strategy of creating evergreen content is definitely one that I will continue to use as a key leg in my content marketing activities. While it takes time to create the content, the reality is that over time the average cost per link (or sale) decreases as the post continues to attract links. Make sure the content appeals to an audience that cares and that shares. 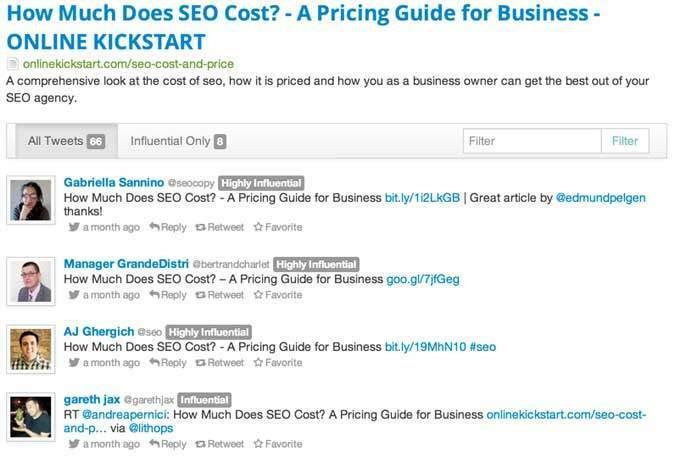 Key to the posts success was that it appealed to SEO practitioners and digital marketers who found it worth sharing. Cultivate relationships. I’m repeating old news here but if several influential people had not chosen to place this content in front of their audiences, then it might not have received the exposure that it did. Thanks to you all. Domain authority, quality and trust matter when choosing a place to publish your post. If you had a choice go with the site that has more authority as it will give you that extra boost in rankings and visibility. One thing that I completely missed when promoting this post was the fact that the “seo community” inbound.org was a powerful referrer of traffic. For digital marketers its a great place to get exposure and at the end of the day it sent me the most traffic. The lesson here is to identify your community of curators and news hounds and put your content in front of them. I must give a big shout out to Hyderali Shaikh who initially submitted the post to Inbound.org. 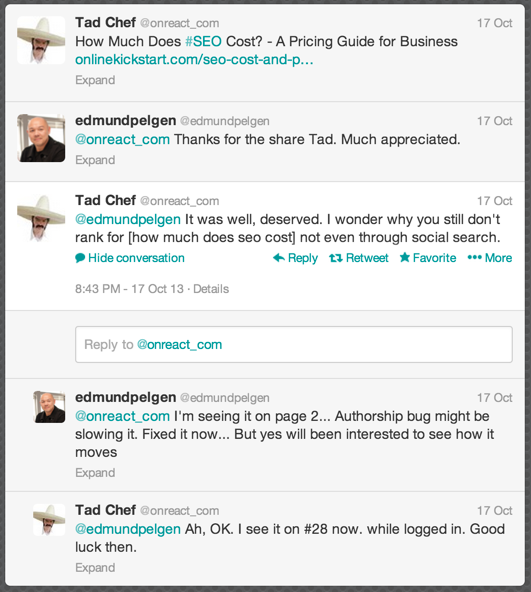 If you want to learn more about getting attention on Inbound.org check out Ta Chef’s post Get Attention on Inbound.org the Right Way. I wish I had read this first. One thing you will notice is that I did not talk about conversions. Why? Well the primary goal of the post was to demonstrate that I could in fact implement the evergreen content strategy. Now that I have data on how it works, in future I will make sure I have a mechanism to capture that referral traffic to my email list until such time as my content ranks and brings in organic traffic to convert. Great summary and insights into the results out of creating an interesting piece of (evergreen) content! A small recommendation: add social sharing buttons to the bottom of every article. Now I have to scroll back to the top! Ha Jan thats a great idea. Hey I put in a table of contents to make it easier to get around. I’ll put some buttons at the bottom as well.